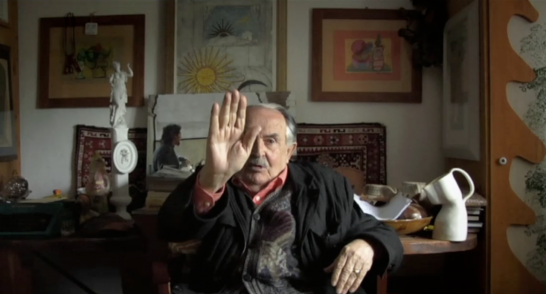 In part one, La Favola del Pennello, the Italian poet and scriptwriter Tonino Guerra is sitting and talking about artists' brushes. During the Second World War he was captured and put in a concentration camp after having fed a cat. With death snapping at his heals, he starts writing poems in Romagnolo, the local dialect of his native district. Miraculously he survives, publishes his writings, becomes a poet and sends the collection of poems to the artist Giorgio Morandi (1890-1964). The painter Morandi likes Tonino's poems and sends a letter to the poet. Tonino wants too see the artist's studio and travels to Morandi to have a look at it. But Morandi doesn't want to show his studio to Tonino and the poet returns with his mission unaccomplished. It is winter and lead-grey rain clouds pass over him. Several months later the artist lets the poet into his studio, which turns out to be a microcosm of dust, associations and terracotta pots filled with brushes. When the poet wants to help the painter throw away some worn-out brushes - bald like old people - the artist responds heatedly and explains thata brush has life because of all the paintings that it has created. One can't just throw them away like something worthless, they have been your friends, the painter explains. The poet Tonino then witnesses an odd ritual for the worn-out brushes and he understands that all good relationships are about love. But before the brush paints what it sees, its other half, the sheet of paper, goes through the whole spectrum of life in a concrete and physical way. 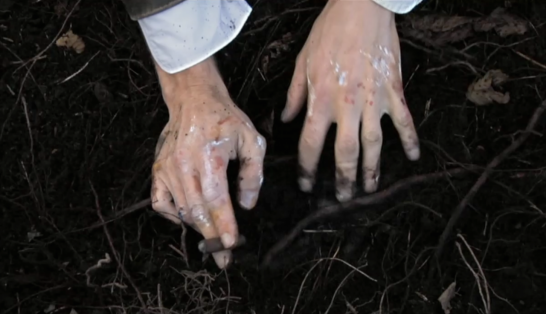 It is soiled by earth, undone by water, dried in the wind in order to burn in heaven. In part two, Il vero Actore, the camera is on a journey. Now, the scriptwriter and poet Tonino takes a more physical form. 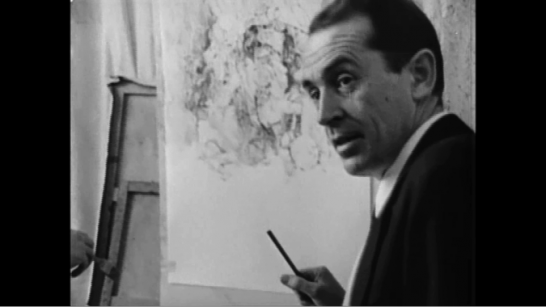 In archival material, filmed by Gianranco Mingozzi, we meet Tonino in the studio of Michelangelo Antonioni, inRome. "RedDesert" has just opened and the sulking Tonino tries to avoid the camera by moving through the room, looking away and into the setting he is taking part in. He states that he doesn't understand interviews. 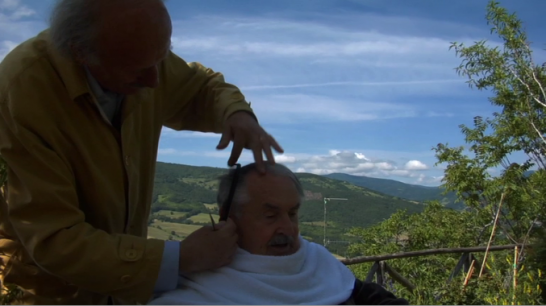 In the summer of 2008, one of Tonino's best friends, the former barber Gianni, cuts his hair. Tonino sits amongst the almond trees, on the same bench Fellini loved to contemplate, and behind him, the Apennines fade away. He tells an anecdote of how it was when he returned from the concentration camp in Germany. Tonino had been gone for some years and no one knew if he was still alive. When suddenly a rumour spread that a group of battered men had returned to the station, everyone in the village ran to welcome them. 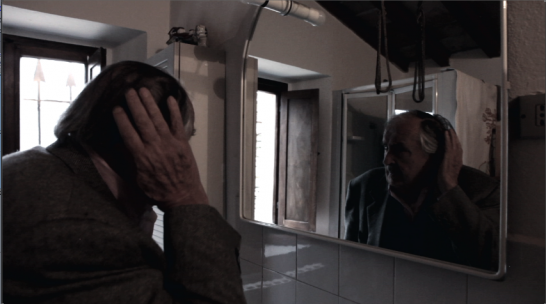 When Tonino's father sees his son, he asks if he has eaten. The villagers gather around the homecoming men who tell of their hardships. Suddenly there comes a barber, whom Tonino's father has sent for, a gesture of care. 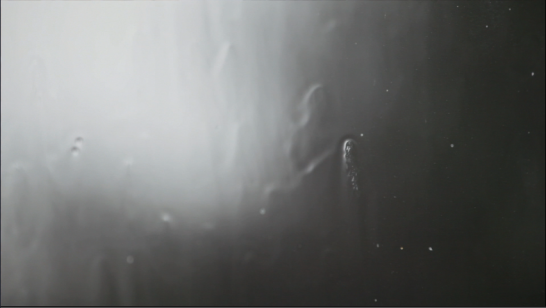 The camera now moves by hand and initiates a closer dialogue. An intimacy has occurred. The mists of the mountains pass before him. The camera seeks to display Tonino's emotions, as he says that the stories of the great directors breathe beyond their own theme. So he weaves together the distant with the closeness. He speaks of old age; that wrinkles and ugliness is important signs the elderly must hand over to the youth, in order to teach them how to live. He remembers his parents who were illiterate; his mother working in a hospital, using non-existing words when she spoke to the ill. When the young Tonino says to her that no one understands her, she points to heaven and answers: "He does... "
In this way he depicts what we can't define within ourselves, that which has no answer. A couple of horses move under the withered apple tree from "La Favola del Pennello". A rainbow surrounds them. Tonino recalls how his mother could whisper to horses. Slowly, he opens to the personal memories. He tells us of the directors who gave him the strongest impressions. They were; Fellini, Tarkovskij, Antoninoni and Paradianov. None of them are here anymore, he says, as a little bird lands on his shoulder and soon flies off again. Leaving behind a small white feather, an ancient christian symbol for the longing of home. The scene changes, and now we are in Fellini's studio. 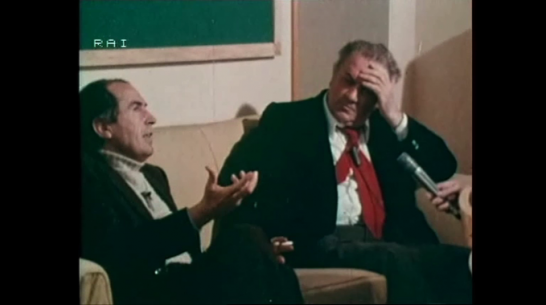 It is in the early seventies and a German film crew is interviewing Fellini and Tonino prior to the work on "Amarcord". When Fellini doesn't understand the questions of the German journalist, Tonino offers to translate. He consciously translates them wrongly and thereby turns the serious questions of the journalist into something different. It ends in the chaos and humour which is significant to Fellini's and Tonino's work. Together with Tonino's own archival material, blended with snapshots from his various movies, he tells us about Antonioni, and how he, in the midst of neo-realism turns his camera towards the bourgeoisie, and how Tonino brought Tarkovskij to Italy to live in exile. He speaks of Paradianovs poetical world grotesque which devoured images explosively. He repeatedly explains that he doesn't like to talk about "Blow up" and all the other movies he made, instead, he wants to speak of the walks and friendships with the directors; that, which determined the work, and that which is left, now that time has passed. He claims that the true actor in a movie is the director. In the afternoon, he has moved further into his garden. We no longer see the wide outlook and the many memories. He tells us that he is a poet and how he observes the world, and that there will be no freedom from injustices as long as we do not solve our problems. The closer he gets to his personal thoughts, the closer the camera comes to him. He doesn't seem to be affected by it, and talks to time itself, its pure flow. 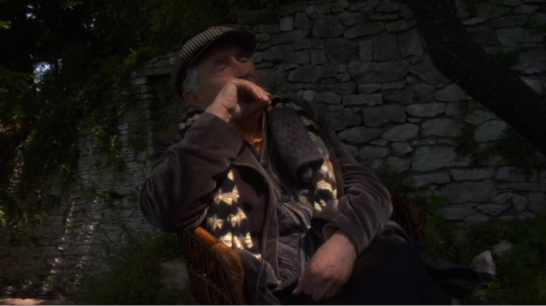 A scene from "Tempo di viaggio" from 1981, where Tonino recites a poem to Tarkovskij. A poem which is part of the manuscript to the movie "Nostalghia". A calm water flow covers the whole picture. Some flowers that look like butterflies glide across the surface. Tonino tells us of his meeting with a Russian monk, who had reduced death to a narrow passage, a transition from one room to another. Once again, he sits amongst the almond trees. His eyes closed in an introvert gaze, whilst Gianni grooms his moustache. Part three, E io la casa non l'ho. 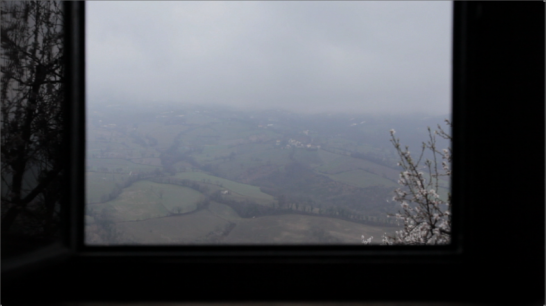 It is the beginning of January 2011, somewhere in the mountains between Florence and Rimini. The view is distracted by rain, snow and mist. Details and texture emerge before entirety and perspective. In a small village, climbing the mountainside, resides Tonino Guerra, for some time he has been severely ill and stands before his death. Lately, he has left all other expressions aside, to focus on poetry and the local language Romagnolo. Due to his physical limitations, he can no longer travel. Instead, he travels within his home by his own tales. Some of them reach across the border, where roads no longer exist, towards something other than else. They move the small sense of happiness which conquers the immense fear. Tonino Guerra is 90 years of age and still active. These days, he devotes his time to that which has always been most important to him, and from which everything else origins. That, which was, and is his first language; poetry and romagnolo. It was as a poet he was requested by the great directors. He is the poet writing screenplays beyond dramaturgical templates, rules and trends. His poetry depicts the humble lives. Italo Calvino said: "His poetry always contains a story, and his stories always contain poems." It was with poetry he managed to pour courage into himself and his fellow-prisoners in the German concentration camp, where death was breathing down their necks, during World war two. 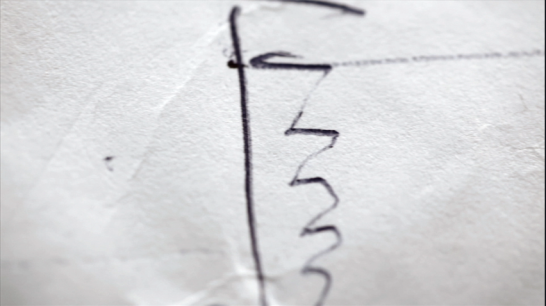 Poetry as mental guidance. Poetry, is a dense language, with images appearing between the lines. It does not seek the room, but the fragment - the detail separated from its surroundings. We follow the poet as his poems emerge. At the utmost border of life itself, where the silence between words becomes an extended period of time. This, of which poetry is said to attain, namely; the creation of eternety in the midst of our presence. Romagnol has an onomatopoetical expression and can easily be confused with the natural sounds that have formed this remarkable language. It reflects the howling of winds between mountains, the clinking of stones, the chattering of rills, the pouring rain, and the dull movements of the earth, the browsing skies and the flickering glance. The natural sounds which has transformed into words and stories. The third part is recorded during wintertime. 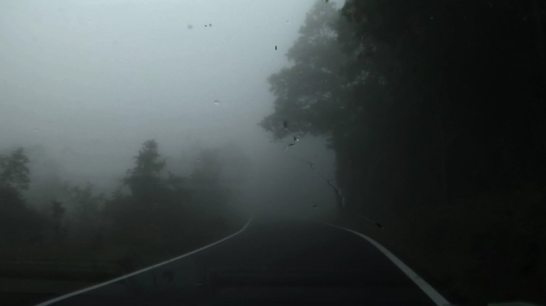 In a shadowy light and landscape, where the torn dark grey sky is filled with mist, rain and snow. As if the film is dipped in the moist vastness of denominations which washes away every clear colour. With the last part, the circle closes. Tonino has returned to his childhood places and uses humble words to describe what it is to be human. In free associations, granted only those who have lived a long life, he launches fragments of stories, aphorisms and maxims against his contemporaries. With the poetry that is always present in Tonino, small talk has been stripped away and only the essential and existential questions remain. Tonino brings the observer to a place where he has never been. To a state lacking of fear and expectations, where the poem, and therewith, the poet, is free. Ultimately it is time for Tonino to leave his house, for the last great journey, but his poetry remains with us. The triptych resembles an iconostasis, where the two previous films are the sidegates, and the third part is the main gate. The gate, through which neither priests nor parish enters - the gate, dedicated to silence.